The Germans are on their way. THE IRISH DEFENCE Forces have been practicing with cannons today, to prepare for incoming Germans. However, there’s no need to panic, it’s all very friendly. 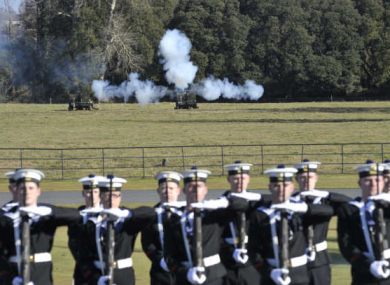 A high-profile German delegation will visit Ireland next week and, as is customary, will receive a 21-gun salute. The salute will be delivered by the Second Field Artillery Regiment, who just happened to be practicing for the visit today, startling some locals near McKee Barracks, beside the Phoenix Park. A Defence Forces spokesperson confirmed that the noises were merely pyrotechnic rounds let off by the practicing artillery personnel. Full details of the visit will be released by the Department of Foreign Affairs in the coming days. Email “If you heard cannon fire around the Phoenix Park today, don't panic”. Feedback on “If you heard cannon fire around the Phoenix Park today, don't panic”.